Why are you hosting the breakfast? The epitome of the Mrs SA 2017 journey, pre-crowning, is the exciting opportunity to host your own, personal and intimate, fundraising event. 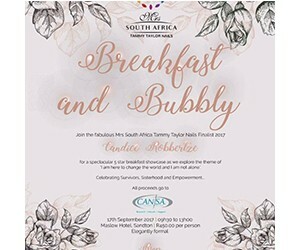 This event showcases your journey as a Mrs SA finalist and is designed for you, as a finalist to call upon your network, family and friends to raise awareness and money for CANSA, a very moving cause. This is my opportunity to show case who I am as a wife, a mother, a public figure, a business woman and a philanthropist. My theme for the CUPPA is ‘I am here to change the world and I am not alone’, Celebrating, Survivors, Sisterhood and Empowerment and I have chosen this theme to represent my life, my story and my journey. I am here as a representation of a powerful and inspiring South African woman with the purpose to impact as many people’s lives as I possibly can. Whether this is achieved through kindness, honour, my business skills, my health and wellness obsession or even my drive for success is not relevant. What is important is that my life matters and I know that I am not alone in this journey. I have also built an incredible network of powerful business partners, friends and family who support each other, take care of each other, network with each other and together we all stand to make an impact in this world. I have chosen to honour SURVIVORS as my father is a survivor of Cancer and as a family we learnt to face, understand and fight the disease together, the journey was a deeply moving one and at the same time, my father’s bravery and courage was unbelievably inspiring. I have also chosen sisterhood as a theme because as part of the Mrs South Africa Tammy Taylor Nails woman empowerment programme 2017, this programme has reinforced the philosophy that as woman and matriarchs of the family and home structure, as mothers, wives, sisters and friends, if we work together we can achieve great things and move mountains. I believe it all starts with the power of sisterhood and working together to build each other up and not break each other down. The theme of Empowerment is and will always be one that is close to my heart. As a business woman with more than 5 businesses and 20 years experience, I have walked the journey of what it means to fight for empowerment and to be considered a valuable and equal partner in the business world. Sipho Mbele is an experienced, astute and influential business professional in the South African Government. He represents public and private sector interests in private equity, commodities, consulting and professional business services. An off the chart genius, Danny is a graduated actuarial scientist, an artificial intelligence guru and the front runner of Machine Learning and all things AI in South Africa. Is a public figure, celebrity and international singer and song writer who drives a National end girl hate campaign focusing on empowering young woman and teaching woman to love themselves and their fellow sisters, knowing it is okay to support each other in the journey called life. Taddy and Annie Bletcher are a husband and wife team who run the Maharishi Institute in Johannesburg, Taddy is an actuary, a management consultant and an educational entrepreneur. He is the World Economic Forum's Global Leader for Tomorrow Award winner for an unprecedented 2 years and is a global thought leader. A qualified doctor and surgeon who after practicing in medical science for more than 20 years moved into holistic healing and opened a healing center called Lumina Lucem in Bedfordview. She is highly sought after global speaker and healing practitioner impacting lives of thousands on a monthly basis. The winner of the Mrs South Africa 2016/2017 Mrs Charity award, Claire Gardiner is a former Mrs South Africa Finalist, a business woman, wife, mother, cancer ambassador and spokesperson. Her life is her story and she is inspirational and a sought after speaker and MC. Also known as Soldier Boy, Garreth Mclellan is a prolific MMA sports figure and personality in South Africa. Unarguably, one of the most popular and successful MMA sportsmen of our time, Garreth has an enormous following on social media and is a motivational speaker, business man, mentor, coach and business owner. A business woman, atmosphere influencer and ground breaker in sales, marketing and all things related to call centers. Claire has successfully managed and run 6 companies for more than 20 years. She is a well recognised and respected thought leader, business woman and motivational speaker. From Dancer to Business Owner and Leader in the Health and Baking Industry of sugar and gluten free products with a distribution chain of more than 200 clients, Candice’s rise to success is profound, exciting and has made her the dynamic, powerful and motivated woman you see before you today. At only 40 years old Candice owns 5 businesses, which not only contribute to the health, vitality and awareness of lifestyle, she is a self empowerment and SME role model to all that meet her and she is a walking, talking smiling advertisement for all things healthy, connected and successful, with a gorgeous and infectious smile. A personal quote by you of why this breakfast is important to you? Let my life inspire as many as I can, I am a wife, mother, business woman.